The Cheese & Spice Market is a local cheese shop, a spice market, and a gourmet food store, all in one. We provide customers with fresh and ripened artisanal and farmstead cheeses, cured meats, hams, salami, pate, and olives, flavorful herbs, spices and teas, and the finest of gourmet products. Cheese & Beer Tasting Featuring Barrage Brewing Co.
Now Hiring Full-time and Part-time Sales Associates! Proud Member - Please support your local businesses! Happy Easter everyone! We are closed today to be with family and friends. Hope you have a great day. Who said rain today? Looks pretty nice right now. Hope to see you soon! Hover over or click on these latest Instagram photos to read the posts. See, smell, taste and enjoy! The Cheese & Spice Market carries a large variety of cheeses, meats, olives and other accompaniments. This is just a sampling of the products we carry, subject to availability. We have high-quality herbs, spices, seasoning, blends (ground and whole), salts and teas from around the world. You will see, smell and taste the difference in the many common to exotic spices we carry. Here is a small example of the products we carry. The Cheese & Spice Market has a wide variety of gourmet products, gift items and accessories. 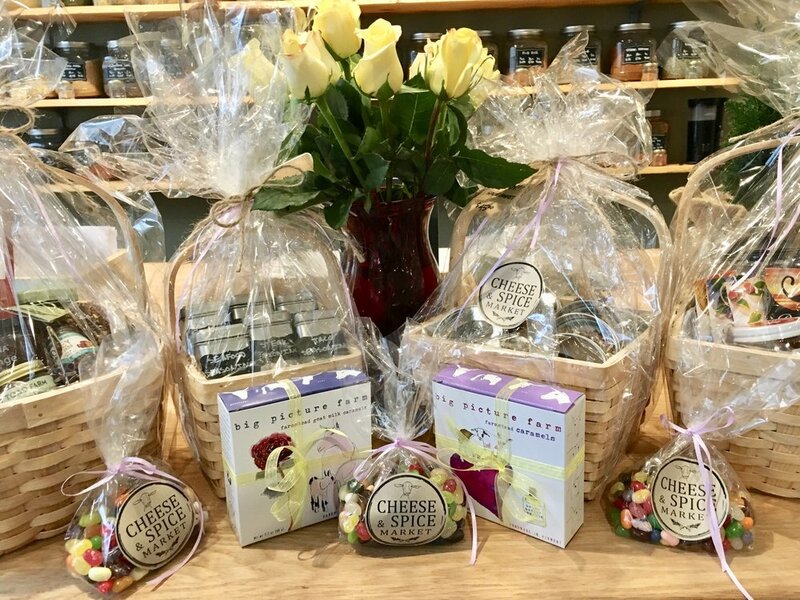 We can help you select gifts and make custom gift baskets for the holidays, corporate functions or personal gifts for birthdays, weddings, housewarmings or any other gathering.